The debate on water privatization is an ongoing debate of public interest not only in India but globally as well. Supporters of privatization argue that water should be viewed as an economic good and hence commoditized. However, as recently as in 2010, the United Nations has recognized the right to water as a basic human right. This raises certain difficult and critical questions over the need and implications of privatizing water in Delhi. This was the central focus during a day long conference on ‘Water Privatization: Learning from India and International Experiences’ which was recently organized at the Indian Social Institute, New Delhi. 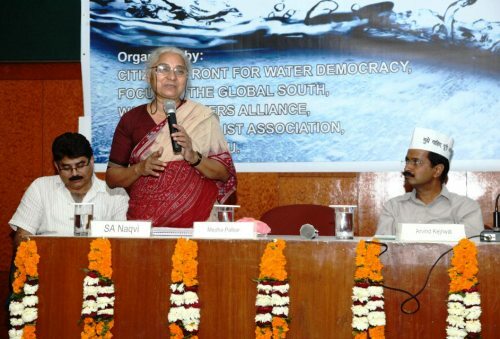 The key organisers of the conference were the Citizens’ Front for Water Democracy, Focus on the Global South, PEACE, Delhi Journalists’ Association, WS&SDEU and the Water Workers Alliance. “There is nothing above the Constitution. The Preamble says India is a secular, socialist, republic and giving over ownership of water to private companies is cheating the Constitution.” was Justice Rajinder Sachar stand as he criticized the Delhi Government’s move to undertake three public-private partnership projects in the city. Pabolon Solon, Water Activist from Bolivia & Former Bolivian Ambassador to UN was also one of the panelists at the Conference. “We have to understand that not only (is the ) right to water a human right but we also have to understand the Right of Water” he said while talking about the issue of dams and their indiscriminate construction. The conference highlighted various cases of privatization across India and deliberated upon the implications associated with them. Against the Government’s claim that privatization will usher meaningful changes in the water sector, Jammu Anand, an employee of the Nagpur Municipal Corporation Employees Union cited an example of Nagpur where privatization and the promise of 24×7 water supply has not shown any positive results. The governance and social issues related to water and its management were also discussed at the Conference. These were largely highlighted by Narmada activist Medha Patkar and activist turned politician Arvind Kejriwal of the Aam Aadmi Party. Arvind Kejriwal discussed the the linkage between corruption and the privatization with respect to the energy and water sectors. “The Sonia Vihar water treatment plant is being operated by French company. They claim to be supplying 140 million gallons (of water) per day while the raw water being supplied to the Plant is just about 90 MGD. The government is also paying them for 140 MGD. How can they possibly manufacture an extra 50 MGD,” asked Kejriwal while discussing the case of Delhi’s water scenario. SA Naqvi of the Citizens Front for Water Democracy also voiced his opinion on the issue. “India is promoting Public Private Partnerships (PPPs) in the water sector despite being a signatory to the UN Resolution of 2010, which recognises Right to Water as a Human Right”, he said. The Conference in itself was a gathering of water activists from all sections of the society. The need to mainstream the issue of water governance was highlighted throughout the Conference since almost all mainstream politicians who were approached to participate refused for one reason or the other. The gathering was dominated by male participants which, in itself, highlighted the need for encouraging participation by women in an issue which is very central to managing a household. The need to bring women in the forefront of water activism as well as the requirement of organising the activist community so it can have a more impactful say was also deliberated during the Conference. It is said that when the well is dry, we know the worth of water. For some reason, this is not becoming the case at least in the deepening water crisis of the NCT of Delhi. Could privatization be a solution is therefore a natural question that comes into the mind. It is upto us now to either be water wise, or be ready to lose open access to the very resource that sustains us all. NextWorld Water Day Art: Save While You Still Can!